WTB & AA 5* Gold Award Luxury bed and breakfast accommodation in the beautiful Old Rectory situated centrally on the Llyn Peninsula - close to Nefyn, Pwllheli, Llanbedrog and Abersoch . Home to the Rectors of Boduan since the early 18th century, the house has been carefully restored over the years and now offers an opportunity for guests to enjoy the relaxing and peaceful atmosphere of a much loved home. The Old Rectory will certainly not disappoint on the attention to detail afforded to our home, the quality of accomodation and most importantly the welcome and comfort of you our guests. ... you will quickly realise that you have come to stay in a truly special and beautiful place. The Old Rectory is set in over 3 acres of grounds in a sheltered area of the lovely Llyn Peninsula, close to Nefyn, Pwllheli, Llanbedrog and Abersoch. Centrally situated for visiting all areas of the peninsula and Snowdonia. 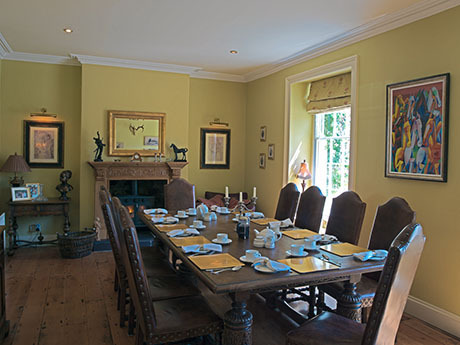 The dining room, with views over the garden, catches the morning sun. This is the perfect setting for a hearty home cooked traditional or continental breakfast, which feature delicious local and home made bread, jams and marmalades, local free range eggs and meats and fish. Vegetarian and special diets can also be catered for - just let us know and we will look after you. Packed lunches and picnics can also be arranged by request. 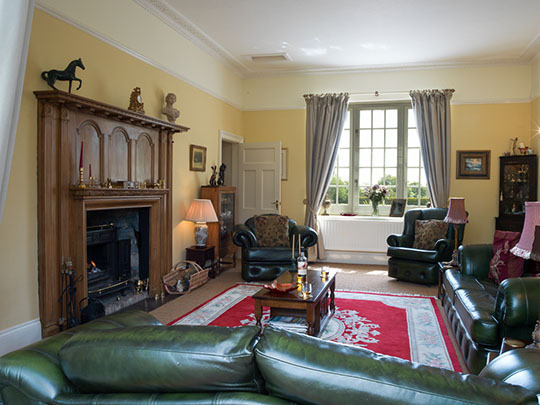 The beautiful light-filled sitting room, with its magnificent fireplace and outlook over the front and rear gardens, is comfortable and relaxing. Log fires add to the welcome in the cooler months and the paintings, antiques and comfortable furniture provide a relaxing and interesting home-from-home atmosphere. Vegetarian and special diets can also be catered for - just let us know and we will look after you. Packed lunches and picnics can also be arranged by request. There is ample parking for cars or boats in front of the house. Do please let us know beforehand if you are bringing a boat. We are sorry that pets are not allowed in the house. A beach hut is available for guests to use from April - September. Although we are listed with some on-line booking sites - they do not always show all our availabilty- so its worth checking with us. You will always find the best rates when you book direct with us. Super King or Twin En-suite Room from £105 per night per room for two people, including breakfast. Standard Double En-suite Room from £95 per night per room for two people, including breakfast. Single Occupancy Rooms available at a reduced rate. A £50 deposit per room is required for all bookings. All deposits are non-refundable and the full amount will be charged in the event of cancellation less than one week prior to arrival unless we are able to re-let the accommodation. Guests may wish to arrange insurance to cover themselves against cancellation. For group bookings of three or more rooms full payment is required at the time of booking. In the event of cancellation within six weeks of arrival no refund will be made unless we are able to re-let the accommodation. Guests may wish to arrange insurance to cover themselves against cancellation. B&B CHECK IN TIME IS BETWEEN 4PM AND 6PM DEPARTURE BY 10.30AM except by prior arrangement. Early or late check in / check out can be arranged and may be charged - subject to availability and prior notification of at least one week.